Baby carrying is something I really wanted to do so I bought several different carriers, 2 slings, 1 Maya Wrap, and was given another wrap style front carrier. I even passed up the infant car seat with the removable carrier in favor of a convertible rear/front facing car seat. I had a feeling I would have a big baby and he might not be in that seat for long. So I spent more on a nicer convertible seat. And I thought, no biggie I'll pop the baby in the sling and head on to the doctor, grocery, etc. I'm so busy around the house: going to the garden, hanging out clothes, baking bread, etc. So I was depending on being able to pop my baby in the sling and go. Well guess what, babies have their own personalities and mine doesn't like having his head crammed into a sling. The videos make the babies look so comfortable, but mine never seemed too cozy. Plus he was mad everytime I put him in, screamed. The best luck I had was with the wrap style front carrier, but it is a little difficult to put on and he slides down in it. I feel like I need to support him with one hand still. The more bad baby wearing experiences I had the more depressed I became. I started thinking maybe I should have gotten the infant carrier car seat. And I resigned myself to not being as mobile with my newborn as I wanted to be. 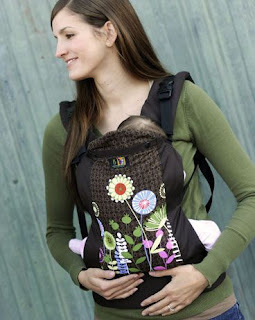 Then while looking on a diapering website I ran into this wonderful invention: the Beco Butterfly 2 baby carrier. It seemed comfortable, easy to adjust, very supportive, and cute! So I researched it as well as I could on the net and asked my wonderful husband for one for my birthday (last week). Unfortunately it is expensive. But I'm hoping to sell some of my other carriers and recoup some money. We only used them once, anyone interested? Well it came today and Simeon and I both love it. Why? - most of all I wore it for an hour and he didn't scream once! Success! I'm sure there's plenty of people out there that have had great experiences with other carriers, but every mom and every child is different and has their own needs. Clothesline here I come again! To each HIS own! Glad you found something that he likes!